Whether you suffer from skin breakouts known as acne, pimples, or zits on a regular basis or just during certain times, such as monthly hormonal changes or seasonal changes, there are several things you can be doing to support healthy skin… and some things you should definitely NOT be doing. To understand how to care for acne prone skin, it is first important to understand a little bit about the skin. Our skin is often considered the largest organ of the body and consists of several layers. Within those layers are pores, hair follicles, and oil glands. Acne is a result of pores becoming inflamed, which can be triggered by several things. Common triggers include hormone fluctuations, food triggers, and genetic triggers that cause the oil glands to produce more than usual natural sebum. Once that occurs, bacteria get trapped in the excess sebum causing inflammation of the pores or hair follicles. To avoid or care for acne on the skin, start a regular skincare routine that includes products designed to support natural balance of skin oils and reduce the bacteria. Jordan Essentials offers products specially designed to help balance acne prone skin for a healthy glow. Skincare starts with cleansing, to remove excess oils, dirt, debris, toxins, and pollutants on the skin. For acne skin, choose from either the JE Complexion Bar, JE Activated Charcoal Soap, or alternate between to two. The JE Complexion Bar contains deep cleansing ingredients such as oatmeal. JE Activated Charcoal Soap will penetrate into the pores to pull out toxins, while re-balancing natural skin pH. With acne skin, you still want to exfoliate the dead skin cells and remove toxins while helping balance the sebum on the skin. However, it is especially important to use an exfoliant that is gentle, so the skin is purified without irritating already inflamed skin. Jordan Essentials offers several exfoliating choices that are both gentle and effective. Exfoliating should only be done about 2-3 times per week. Daily after cleansing (and exfoliating), Soothe damaged and irritated pores with JE Acne Support Gel. This carefully formulated gel is perfect for spot treating blemishes and contains Willow Bark, which helps reduce inflammation and soothe the skin. 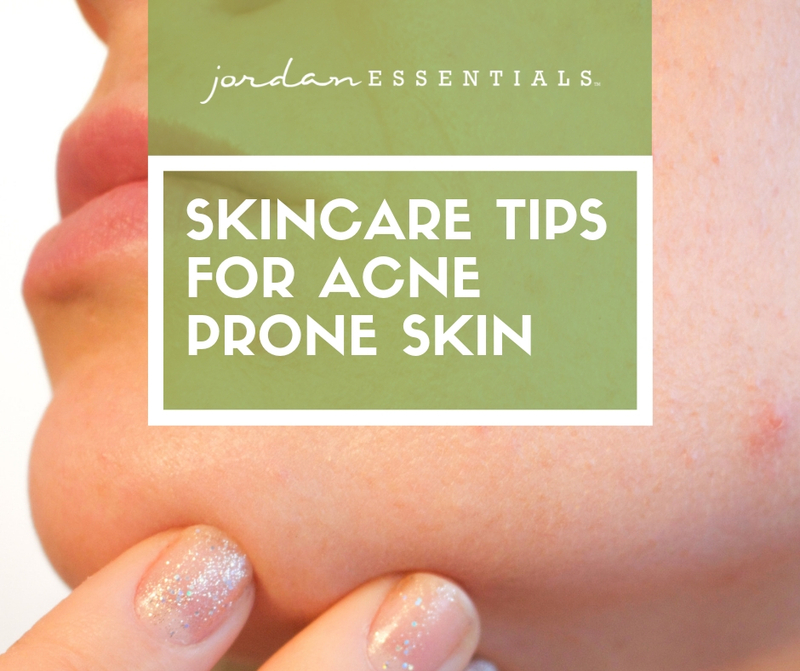 After cleansing, exfoliating, and treating, it is important to encourage those pores to tighten, particularly when dealing with acne or blemishes. Open pores are more prone to getting clogged and irritated with the excess sebum production which encourages the bacteria that causes inflammation. Follow your cleansing routine with JE Toner Mist, which includes carefully chosen botanicals to support healthy skin. For an additional anti-acne boost, try adding 10 drops of Jordan Essentials’ Tea Tree Essential Oil to a full bottle of JE Toner Mist. Tea Tree Essential Oil is antibacterial and will help combat acne bacteria. Regardless of age, studies show that peptides in anti-aging skin treatments like Jordan Essentials’ Multi-Peptide Firming Serum increase collagen production which also combats skin blemishes. This serum will also help balance skin moisturizing synthesis for smoother, healthier skin. Acne skin sometimes needs a little extra help in balancing and moisturizing, so to wrap up your skincare apply JE Acne Support Moisturizer with Willow Bark Extract. The powerhouse combination of this whole skincare routine, using amazing natural ingredients known to support healthy, balanced skin like oatmeal, activated charcoal, tea tree essential oil, and willow bark will replenish your skin and help combat those irritating, and sometimes painful blemishes. Although it may be tempting when blemishes appear to squeeze them and/or try to pop them, resist the urge! Blemishes and acne, as we mentioned above, are a result of inflamed pores. Popping them just increases the irritation, and can also invite more problems such as increased bacteria, deeper inflammation, possible infection, and even potential scarring. Some people are genetically more prone to getting acne than others. If this is you, experiment to see what triggers tend to make things worse, such as certain foods, certain stress triggers, certain activities, or hormones. If you have a better idea of what are some triggers for your skin, you can work to avoid them or find additional options to help reduce the cause. It is always recommended to consult with a doctor or dermatologist if your condition worsens or becomes particularly painful. And remember, love yourself and love your skin. Too often we only see the blemishes in ourselves and become self-conscious about them. In reality, everyone has amazing and beautiful qualities regardless of whether there are a few skin blemishes. Let your inner light shine and keep smiling. You got this! Comment below with your favorite JE products for Acne or any personal testimonials on how JE helped you and your skin. Information provided for educational and entertainment purposes only. Jordan Essentials does not claim to diagnose, prevent, treat, or cure anything. No information is intended to replace the advice of a healthcare professional. Consult your dermatologist with specific skin concerns.